A Serviced Office is an office that is fully equipped and managed by a facility management company, which then rents individual offices or floors to other companies. Serviced Offices, which are also referred to as Managed Offices, Business Centers, Office Business Centers, Executive Suites or Executive Centres, are usually found in the business districts of large cities around the world. A Serviced Office can be considered as a “Packaged Deal” and they are usually available at short notice and for short periods of time. A serviced office can be rented for as short a period as two / three months or more. A serviced office typically comes with more than just the space and the rental price will include the office space, rates, services and so on. Serviced offices will be furnished and come complete with internet and telephone connectivity, usage charges are extra. They will usually be in a business centre that provides a staffed reception, secretarial, admin and often business services. New technology, emerging competition and mergers have changed the way people work around the world. These forces have given rise to a highly mobile workforce that spends less time in the office and more time working from, virtually anywhere they can find an internet connection. This is where serviced offices come into play. Serviced offices are a total solution in the sense that they are fully fitted and furnished, ready for immediate occupation. The building operator takes responsibility for all of the services to the building, and in addition, provides a range of business services including reception and telephone answering services, secretarial support, conference and meeting facilities, video conferencing and high speed internet access. In serviced offices, there are no additional costs for business rates, lighting & power, security, cleaning, building & plant maintenance, elevators, insurance etc. The only additional costs, on top of rent, are for telephone / internet usages which are normally charged at standard rates. While costs may look high initially, the rent that you pay includes almost all of the costs that you would normally expect to pay on top of rent in a traditional office. Neither are there any charges for furnishings which are normally the latest workstations with chairs, filing systems and tables for meeting rooms. This is usually a significant cost for any occupier and is included in the serviced office rent. A major difference between serviced offices and traditional offices, which is one of the main reasons for deciding to use them, is the length of the lease. 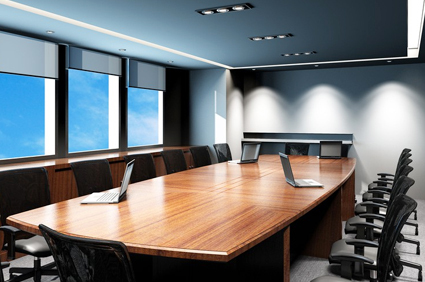 A serviced office lease may be as short as 3 months, or more typically 9 or 12 months. This is very different from the 3 / 6 / 9 / 12 years lease normally associated with a traditional office and gives many organizations the much needed flexibility to shrink or expand as their business dictates. Serviced offices originated in the 1980s in the major US business cities, evolving from call centers for traveling salesmen. There is a growing need for serviced offices not only for big corporate, but also for small and medium size companies. In major cities across the world, such as New York, serviced offices account for 10% of the total office space available, while in India, the serviced office inventory would amount to only about 0.1%. The serviced offices are spaces equipped with corporate infrastructure and support services and given out to companies on a pay-per-use basis. The trend has caught on globally with multinationals, big corporate and startup companies looking for serviced offices to set up shop quickly and economically, without capital infusion towards acquiring and leasing of real estate premises. The demand from corporate for serviced ready-to-use offices, instead of conventional office on long-term lease basis, has started gaining momentum and is growing at the rate of 15% to 20%, feel industry experts. To cash in on the opportunity, serviced office providers are planning to expand such office centers in India, apart from initiating talks with top builders in order to start serviced office concepts within the latter’s commercial buildings. Unlike in conventional lease offices where corporates are committed to pay rent till the long-term lease period ends, organizations using serviced offices can use the space for as short a period as one single day and exit. The users of serviced offices are not committed to paying long-term rent. It is a win-win situation for both the provider and the end user.